Our how-to guide shows the easy fill process of the T0781, T0782, T0783, T0784, T0785 & T0786 ink jet cartridges. Also covers information about the ARC (auto-reset chips) and refilling information. Instructions on Filling & Refilling Epson Compatible T781, T0782, T0783, T0784, T0785 & T0786 ink jet cartridges with ARC (auto-reset chips). The refillable cartridges for T0781, T0782, T0783, T0784, T0785 & T0786 contain an auto-reset chip. Once ink level falls to a predetermined level the chip automatically resets to near full capacity.Cartridges have a 10+ml capacity per cartridge. These cartridges are of a 2 plug design, but not pressure filled as previous 2P cartridges were.One plug is used as a fill hole while the other is a vent plug. The image on the right shows the two plug locations. Fill injector with desired color ink. 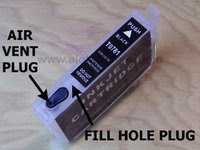 When completed injecting ink replace original clear fill hole plug. That is it. Cartridge has now been filled and is ready for use.Though the image to the right shows the cartridge laying on it side this is not recommended. It was taken this way to show the ink in the cartridge. Always keep cartridge upright. Before attempting to use any cartridge make sure you have ALL cartridges filled.Cartridges do not work independently. The printer will show an error message of only one - five refillable cartridges are installed. Replace any cartridges already in the printer with a complete set of refillable cartridges. 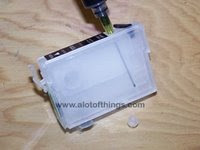 Once all cartridge have been inserted remove the vent hole plug from the cartridge.The vent hole plug is the color plug. On the image to the right the two leftmost cartridge plugs have been removed. After removing all six plugs hit the ink cartridge button.Printer will begin to run an initial cartridge prime, the same as when any new cartridge is installed.After prime has been completed run a print test. As with the OEM cartridges, refillable cartridges may not appear on the Epson Print Status window at all times. (image on right). If you open your printer properties window you can see the current status of the ink levels. (image on left of picture). This usually only occurs when running multiple print job without breaks in between. Once a break in the print occurs your ink level will appear in the Print Status window once again.The ink level not appearing in the Status window is not an aftermarket related issue, but a printer related issue. This occurs on both OEM cartridges as well as aftermarket. Never install less than 6 refillable cartridges at one time. Printer will not recognize the Epson cartridges when one of the refillable are installed. These cartridges will reset automatically. There is no hitting cartridge change button or turning printer on and off required. Cartridge will all auto-reset at same time. It is advised that all cartridges be refilled at this time to prevent any cartridge running out of ink.Some cartridge may contain a good deal more ink than others depending on the first cartridge that requires reset. In most cases this is black. (under testing of 5 sets using of cartridges on 1 each R260, R380 & RX580). After initial fill when you are ready to refill return allplugs back to cartridge. Remove cartridges from printer and repeat fill process. There is no difference in refill from the initial fill.